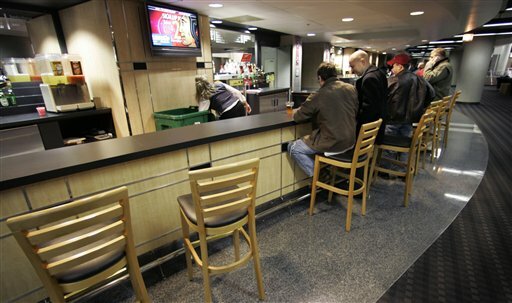 The UC bar stools may be empty at Blackhawks games for a while. Do you ever stop to notice the people around you when you go to a sporting event? Not the fans or the players, but the various workers: the people taking your tickets, guiding you into your parking spot, selling you nachos or a hotdog. How many people work at, say, the United Center over the course of a game? The number is in the hundreds. With the National Hockey League in the early stages of a lockout, it won&apos;t just be the teams and the owners that suffer financially. The players union, led by Donald Fehr, is pitted against the owners and NHL commissioner Gary Bettman. It is their fight, but others have and will suffer if the lockout goes as many think — on for months. The league has announced that their employees will have a 20 percent pay cut and some teams are laying off employees. (The Blackhawks are retaining their staff.) Players are making plans to play in Europe; Michel Frolik, for example, has inked a deal with the Czech Republic. Others will follow as time goes on. But the vendors, ticket-takers and other stadium workers that us reporters get to know over the years get paid per game: If there&apos;s no game, there&apos;s no pay. The people I worry about are people like Mike, the beer vendor, who shouts at the top of his lungs and can tell you any stat about any player. Or Tom and Sid, who assist media and use the job to supplement their Social Security income. There&apos;s Al, who saves me a parking spot when I have to arrive after the face-off, and Chris, who goes to school and holds down another job to make ends meet. I know a single mother who worries about taking care of her son if there is a long dispute. This is the second time in two years that many of these hard-working service people will be impacted by a labor dispute, because they work both NBA and NHL games at the United Center (the NBA lockout lasted until Christmas Day). That money can&apos;t be made up and these folks have no voice in the matter. The NHL has canceled pre-season games. As time passes there will be more. Once the regular season games are lost, the impact will bring people like Mike, Tom, Sid and Al even more financial hardship. There is a lot at stake here: An end to this labor disagreement is crucial for the hundreds of people that help you enjoy a game.